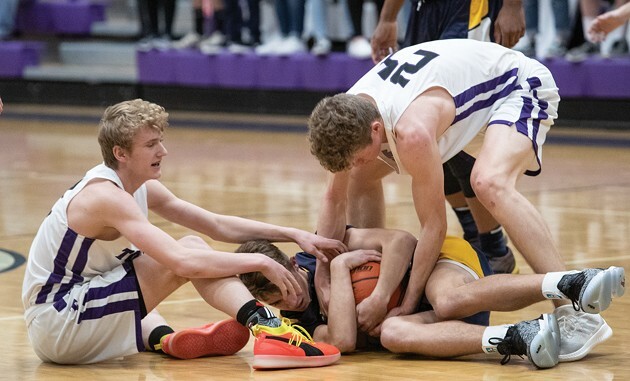 Tooele sophomore Justin Rogers (24 in white) is swarmed by Bonneville defenders Zach Alspaugh (0) and DJ Frye during the first half of Friday’s Region 11 boys basketball game at Tooele High School. Rogers had 19 points in the Buffaloes’ 57-50 loss to the Lakers. Tooele’s Canyon Christensen (left) and Justin Rogers battle for a loose ball with a Bonneville player during the second half of Friday’s Region 11 boys basketball game at Tooele High School. Bonneville won the game 57-50, knocking Tooele into fourth place in the region standings with four games remaining in the regular season. 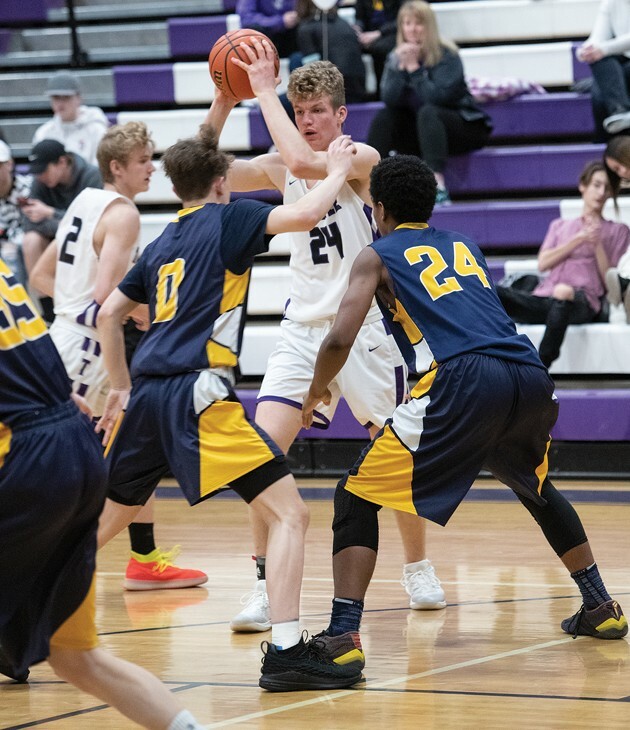 The Tooele boys basketball team came into Friday’s Region 11 home game against Bonneville with its sights set on home-court advantage in the first round of the upcoming Class 4A state tournament. After losing to the Lakers 57-50, the Buffaloes are now in a fight to make it to the postseason, period. 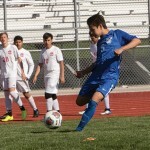 The defeat knocked Tooele into the fourth and final playoff spot in the region standings with four games left in the regular season, one game behind rival Stansbury and half a game ahead of Park City. The Buffs (10-10, 4-4 Region 11) led 37-33 with 1:20 left in the third quarter after senior Nathan Swan knocked down a 3-pointer, but Bonneville (12-5, 6-2) responded by outscoring Tooele 18-7 over the next 6:29. During that stretch, the Lakers’ Luke Dixon hit four 3-pointers and Tyler Hancock and Zach Alspaugh also hit clutch shots down the stretch. The Lakers’ lead eventually swelled to 11 points in the final seconds before Tooele closed the gap from the free-throw line. That gave the Buffs the head-to-head point-differential tiebreaker, as Tooele defeated Bonneville by eight points earlier this season, but Tooele would need the Lakers to lose two more games against a favorable schedule for that to be a factor. Bonneville’s physical style of play wreaked havoc on the Buffaloes all night, forcing 12 turnovers. Tooele shot just 16-for-41 (39 percent) from the field, including 10-for-28 (36 percent) from inside the 3-point arc. Justin Rogers led the Buffs with 19 points. Swan had 15 points and six rebounds and Canyon Christensen added 11 points, hitting all three of his 3-point attempts, to go with three rebounds and three assists. Josh Wilkins had three points and Clay Freeman finished with two. Alspaugh led Bonneville with 13 points, while Dixon had 12 and Jordan Citte added 10. Hancock and Hank Bushell had nine each and DJ Frye and Kinnon Finder each scored two for the Lakers. 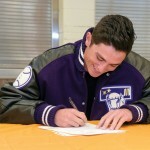 Tooele faces a crucial game Wednesday at home against county rival Stansbury. 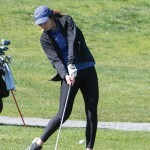 The Stallions edged the Buffs 50-49 in the teams’ first meeting in January, and Tooele could earn the upper hand in the playoff race by beating Stansbury by more than a point. However, a Stansbury win would give the Stallions a two-game lead on the Buffs for third place, as well as the head-to-head tiebreaker.